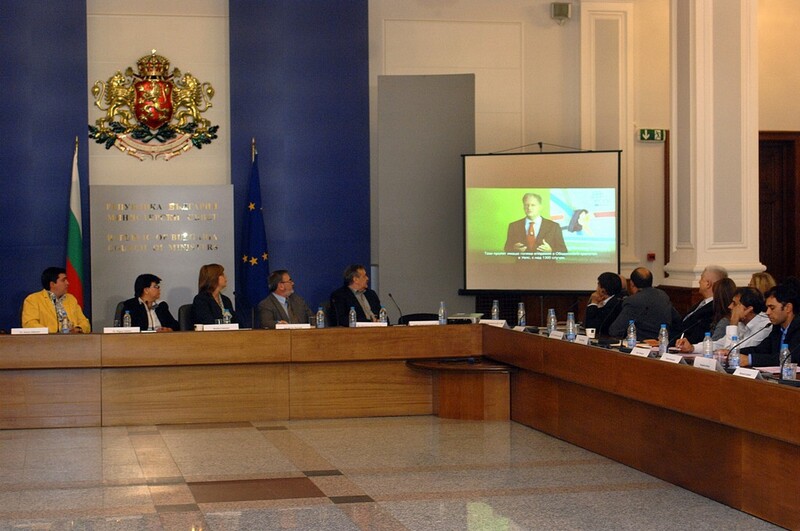 On 27-th September 2013 in Granite hall of the Council of Ministers the VII National Meeting “Initiative for Health and Vaccination” took place. The project is implemented by the National Council for Cooperation on Ethnic and Integration Issues at the Council of Ministers together with the Health Commission at the Parliament and the Ministry of Health. 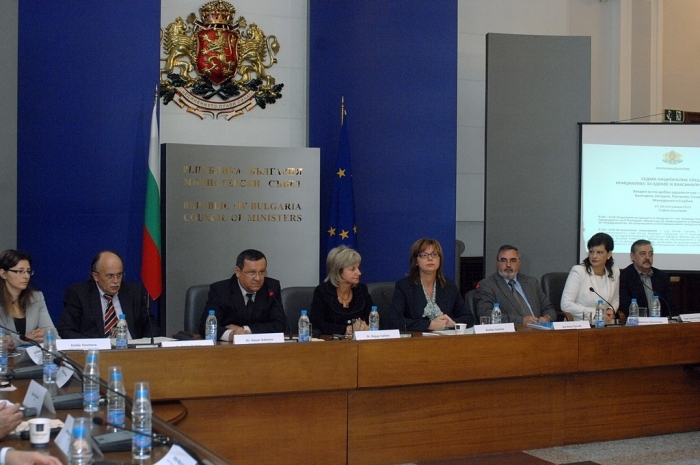 Initiative partners are the Ministry of Labour and Social Policy, Ministry of Education, Ministry of Finance, Association “National Network of Health Mediators” (NNHM), National Association of General Practitioners in Bulgaria, Bulgarian Association for Vaccination, patient organizations, with the support of GlaxoSmithKline. The meeting gathered representatives from the state, NGO and private sector from Albania, Bulgaria, Macedonia, Romania, Slovakia, Serbia and Hungary with the aim to discuss the practices for improving the access to healthcare of the vulnerable groups belonging to ethnic minorities in the region and to present the Bulgarian experience in prevention of vaccine-preventable diseases as well as the possibilities for extending the project in other areas of work. The meeting was opened by the Chair of the Health Commission d-r Nigiar Sahlim who is our partner in the efforts to improve the healthcare in Roma communities since 2003. She shared that the lacking immunizations among large groups of the society is one of the major problems in Bulgarian healthcare and that the strengthening of the statute of Health mediators is one of the big achievements of the vaccination project. D-r Hasan Ademov, Minister of labour and social policy also addressed the guests of the event: “Grace to the unique model for cooperation in 2010 the measles epidemic outbreak was put under control. The next year Bulgarian experience was transferred to Serbia and FYROM where a project for training of Health mediators working on the field was implemented”. Now Health mediators from several countries are united within the international project “Together for better health – from us, for us” in which Bulgarian experience is leading. D-r Boyko Penkov, Deputy Minister of healthcare stated that “one of the project aims is increasing the information of the society with regard to preserving health and lowering child mortality”. The guests of the event were saluted by d-r Mark Muskat, Consultant at the European regional office of WHO and Ms Emilia Toncheva, Head of WHO office in Bulgaria. D-r Muskat shared that one of the main objectives of WHO is to strengthen the role, scope and abilities of Health mediators to serve the vulnerable groups of the population and to be supporters of the General Practitioners. The Director of European Centre for Disease Prevention and Control (ECDC) D-r Mark Sprenger sent a video-message to the participants in which he underlined the Bulgarian experience in coping with health challenged among minority groups and presented the ECDC project “Let’s talk about protection” in which Bulgaria is chosen as a pilot country for its implementation. D-r Angel Kunchev, Chief State Health Inspector presented Bulgarian experience in overcoming the measles epidemic in 2010 and underlined that main reason for success is the established cooperation which unites the Health mediators, Regional Health Inspectorates and General Practitioners. He underlined the need for permanent increase of the number of Health mediators working in the country. The Secretary of the National Council for Cooperation on Ethnic and Integration Issues (NCCEDI) at the Council of Ministers, Ms Rositsa Ivanova shared that the Health mediators are fundamental part of component “Healthcare” of the National Strategy for Roma Integration 2012-2020. “I am proud that this policy is sustainable throughout all these years”. Representatives of state institutions and medical specialists from Albania, Macedonia, Slovakia and Hungary also presented their national strategies for Roma integration and improving their health status. Prof. Ivailo Tournev, Chairman of Ethnic Minorities Health Problems Foundation, member of the NCCEDI and member of NNHM presented the process of institutionalization and strengthening of the profession Health mediator in Bulgaria. He underlined that the cooperation with GlaxoSmithKline Company in project “Initiative for Health and Vaccination” since 2010 has been a great incitement for the Health mediator’s programme. Reader Yavor Ivanov, Chairman of Bulgarian Society for Lung Diseases pointed out the importance of the participation of Health mediators in the implementation of national programmes for prevention, control and treatment of chronic respiratory diseases. The field work and the main challenges for the Health mediators were presented through the experience of Krasimir Kirilov from Sliven and Zahari Atanasov from Chubra village. Prof. Mira Kozhuharova, National Epidemiology Consultant and Diliana Dilkova from NNHM presented details about ECDC project “Let’s talk about protection”. Paul van Hoof, Coordinator of the international project of pharmaceutical company GlaxoSmithKline “Together for better health – from us, for us” which gathers the efforts of Bulgaria, Romania, Slovakia and Hungary for improving the access of vulnerable groups to healthcare and education presented the project and its main goals. In Bulgaria each year 15 Health mediators work for the project – every next year they are appointed to the respective municipalities through state budget. GSK honors the most successful mediators in educational modules and on the field with diplomas. After the official part of the meeting the guests divided in 3 groups: the representatives of state institutions and medical specialists discussed the importance of Health mediator’s role and the institutionalization of the profession; training module was organized for all Health mediators from Bulgaria, Macedonia and Serbia; the participants in the international project “Together for better health – from us, for us” discussed the project results, shared good practices and outlined the next steps.